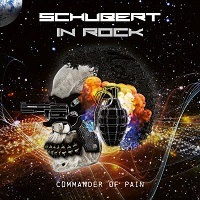 Austrian guitar legend Klaus Schubert has compiled yet another impressive guest line-up for his current SCHUBERT IN ROCK release, “Commander Of Pain” on Pure Steel Records. Featuring guest musicians such as OZZY and DEEP PURPLE keyboard alum Don Airey, Jennifer Batten, Ewald Sunny Pfleger, Gery Moder and more, “Commander Of Pain”, real focus is on creating a playground for some of Heavy Rock’s mid-tier vocalists. Performing songs specifically written for each individual vocalist, the songs themselves are impeccable. The multiple vocalists however, creates a bit of a mis-jointed project overall to my ears. The album starts off wonderfully with “Empathy”. Featuring Jeff Scott Soto of SONS OF APOLLO and TRANS-SIBERIAN ORCHESTRA, this is one of the strongest tracks on the album. Soto is featured strongly again a few tracks later on “Forgive Me When I Fall”. Next up we have “Burning Heart” which features the distinctive growl of Marc Storace of KROKUS. Storace also takes on the responsibility of the album’s title track “Commander Of Pain” quite successfully. “Little Boy” follows with SCHUBERT IN ROCK’s own Walt Stuefer on lead, and it causes one to wonder why the ensemble doesn’t simply rely on Stuefer for all their vocals, rather than going through the logistical nightmare it has to be to schedule around all the other vocalist’s availability. “Too Late” and “It’s Our World” gives original NAZARETH singer Dan McCafferty a turn at the microphone. While “World With No Tomorrow” has current NAZRETH vocalist, Carl Sentence. “Under The Lights” features Doogie White (RAINBOW, MICHAEL SCHENKER). White closes out the release with “My Name Is Judas”, as well. The individual songs are all very well done, and as individual tracks I found them extremely enjoyable. Unfortunately, as a collected work, the album just seems to never find its place. I realize this may sound odd, but it’s something that stuck with me through repeated listens. I guess I would have rather had only one vocalist (again, why not Stuefer?) than a different vocalist each song. Still, it does nothing to diminish the stellar performance the musicians and Schubert in particular have succeeded in capturing.